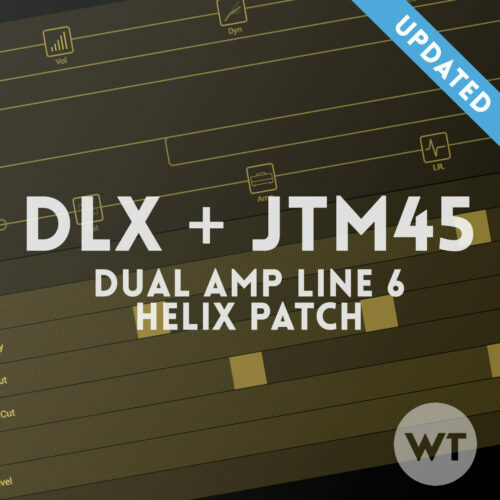 The ultimate Fender flavored Line 6 Helix patch using the Fender Deluxe Reverb and Marshall JTM45 amp models, specifically dialed in with effects for modern praise and worship tones. Includes two patches – an IR-ready patch and a stock Helix cab patch. The IR’s are not included. Current version: 2.0 (released 11/20/2018) – See the changelog below to see how we’ve improved this patch. NOTE: This patch has been updated significantly since this demo. We’ll have a new demo up soon! Cali Q Graphic – Always on EQ – Use this EQ to make tonal tweaks for your guitar/setup. These controls will affect your tone differently than the amp controls. See below for recommended settings. This patch is meant to be used in either stompbox or snapshot mode. We recommend setting up your Helix to use all ten stomps (stompbox mode) or all eight snapshots (snapshot mode). The Helix LT does not allow 10-button stomp mode, so you’ll have to re-arrange the button assignments to suite your preferences. Feel free to stack drive pedals for bigger sounds. The dotted 8th delay is in parallel with both the quarter delays, so they’ll be more rhythmic when used together. They are also set to output in stereo when the Helix is used in stereo (using both outputs). If you only use the Left/Mono output, the entire patch will be summed to Mono. There are eight snapshots included in this patch to get different sounds (all patches feature the same snapshots). Snapshot 1: CLEAN. This is the base clean tone with delay. Snapshot 2: DRIVE. Light overdrive. Snapshot 3: DRIVE+: Bigger overdrive. Snapshot 4: P&W LEAD: Big drive with big delay and verb. Snapshot 5: CLN VERB – Clean tone with big reverb. Snapshot 6: CLEAN TREM – Tremolo and verb. Delicious. Snapshot 8: BIG SWELLS – this uses the ‘Swells’ stomp button plus more verb and delay. Updates are free and delivered via email. If you have an older version of this patch and have not received updates via email, please send us a support email and we’ll get the updated patch files to you. 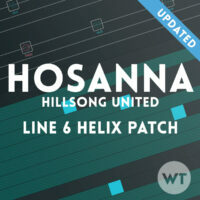 The guys at WT really hit a homerun with this patch. Maybe it’s because I’m a tele guy that likes fender amps but this patch is for real. I have some of the best IRs out there and I didn’t even feel like I needed to use one because I like this patch so much the way it is. I haven’t reviewed any of the other patches on here because I felt like I needed to tweak them a lot to get the sounds I wanted. BUT, not so with this one! All I tweaked were the mix and feedback levels on the delays and DONE! Do yourself a favor and get this patch. It is most certainly worth it! Love it. Great for worship, rock, funk, blues…you name it. Sounds great. And the way the snapshots are set up is just so practical. Keep crankin’ em out boys because your hard work is making me sound so much better! An outstanding Patch. I have been using this patch for sometime now and as of yesterday, it has become my go to patch. I use it both at Home and Church. Great work guys.